1 A None No Power Seat 1 A is a First Class Bulkhead seat. The proximity of the bulkhead may be bothersome and there is no footrest for this seat. There is no floor storage for this seat during take-off and landing and overhead storage is limited due to the storage of emergency equipment. 1 B None No Power Seat 1 B is a First Class Bulkhead seat. The proximity of the bulkhead may be bothersome and there is no footrest for this seat. There is no floor storage for this seat during take-off and landing and overhead storage is limited due to the storage of emergency equipment. 1 C None No Power Seat 1 C is a First Class Bulkhead seat. The proximity of the bulkhead may be bothersome and there is no footrest for this seat. There is no floor storage for this seat during take-off and landing and overhead storage is limited due to the storage of emergency equipment. 1 D None No Power Seat 1 D is a First Class Bulkhead seat. The proximity of the bulkhead may be bothersome and there is no footrest for this seat. There is no floor storage for this seat during take-off and landing and overhead storage is limited due to the storage of emergency equipment. 10 A None No Power Seat 10 A is a Delta Comfort+ seat, however this curtain bulkhead may be bothersome. The tray table is in the armrest, making the armrest immovable and slightly reducing seat width. There is no floor storage for this seat during take-off and landing. 10 B None No Power Seat 10 B is a standard Economy Class seat, however this curtain bulkhead may be bothersome. The tray table is in the armrest, making the armrest immovable and slightly reducing seat width. There is no floor storage for this seat during take-off and landing. 10 C None No Power Seat 10 C is a standard Economy Class seat, however this curtain bulkhead may be bothersome. The tray table is in the armrest, making the armrest immovable and slightly reducing seat width. There is no floor storage for this seat during take-off and landing. 10 D None No Power Seat 10 D is a Delta Comfort+ seat that has some extra legroom as the bulkhead does not extend all the way to the aisle however, other flyers tend to bump into this seat. The tray table is in the armrest, making the armrest immovable and slightly reducing seat width. There is no floor storage for this seat during take-off and landing. 10 E None No Power Seat 10 E is a Delta Comfort+ seat, however this curtain bulkhead may be bothersome. The tray table is in the armrest, making the armrest immovable and slightly reducing seat width. There is no floor storage for this seat during take-off and landing. 10 F None No Power Seat 10 F is a Delta Comfort+ seat, however this curtain bulkhead may be bothersome. The tray table is in the armrest, making the armrest immovable and slightly reducing seat width. There is no floor storage for this seat during take-off and landing. 13 A None No Power Seat 13 A is a standard Delta Comfort+ seat, however this seat is missing a window. It is a Preferred Seat which is reserved for Delta Medallion members. This seat may be selected by Medallion members at time of booking or afterwards. This seat becomes available to all passengers at time of check-in. 13 C None No Power Seat 13 C is a standard Delta Comfort+ seat. It is a Preferred Seat which is reserved for Delta Medallion members. This seat may be selected by Medallion members at time of booking or afterwards. This seat becomes available to all passengers at time of check-in. 13 D None No Power Seat 13 D is a standard Delta Comfort+ seat. It is a Preferred Seat which is reserved for Delta Medallion members. This seat may be selected by Medallion members at time of booking or afterwards. This seat becomes available to all passengers at time of check-in. 13 F None No Power Seat 13 F is a standard Delta Comfort+ seat. This seat is reserved for Delta Medallion members. This seat may be selected by Medallion members at time of booking or afterwards. This seat becomes available to all passengers at time of check-in. 14 A None No Power Seat 14 A is a standard Delta Comfort+ seat with a misaligned window. It is Preferred Seating which is reserved for Delta Medallion members. This seat may be selected by Medallion members at time of booking or afterwards. This seat becomes available to all passengers at time of check-in. 14 C None No Power Seat 14 C is a standard Delta Comfort+ seat. It is Preferred Seating which is reserved for Delta Medallion members. This seat may be selected by Medallion members at time of booking or afterwards. This seat becomes available to all passengers at time of check-in. 14 D None No Power Seat 14 D is a standard Delta Comfort+ seat. It is Preferred Seating which is reserved for Delta Medallion members. This seat may be selected by Medallion members at time of booking or afterwards. This seat becomes available to all passengers at time of check-in. 14 F None No Power Seat 14 F is a standard Delta Comfort+ seat with a misaligned window. It is Preferred Seating which is reserved for Delta Medallion members. This seat may be selected by Medallion members at time of booking or afterwards. This seat becomes available to all passengers at time of check-in. 15 A None No Power Seat 15 A is a standard Delta Comfort+ seat that is missing a window. It is Preferred Seating which is reserved for Delta Medallion members. This seat may be selected by Medallion members at time of booking or afterwards. This seat becomes available to all passengers at time of check-in. 15 C None No Power Seat 15 C is a standard Delta Comfort+ seat. It is Preferred Seating which is reserved for Delta Medallion members. This seat may be selected by Medallion members at time of booking or afterwards. This seat becomes available to all passengers at time of check-in. 15 D None No Power Seat 15 D is a standard Delta Comfort+ seat. It is Preferred Seating which is reserved for Delta Medallion members. This seat may be selected by Medallion members at time of booking or afterwards. This seat becomes available to all passengers at time of check-in. 15 F None No Power Seat 15 F is a standard Delta Comfort+ seat. It is Preferred Seating which is reserved for Delta Medallion members. This seat may be selected by Medallion members at time of booking or afterwards. This seat becomes available to all passengers at time of check-in. 16 A None No Power Seat 16 A is a standard Economy Class seat that Delta designates as Preferred Seating which is reserved for Delta Medallion members. This seat may be selected by Medallion members at time of booking or afterwards. This seat becomes available to all passengers at time of check-in. This seat has limited recline due to the Exit Row behind. The seat cushion at this seat is thinner than that of the standard Economy Class seat. 16 B None No Power Seat 16 B has limited recline due to the Exit Row behind. 16 C None No Power Seat 16 C has limited recline due to the Exit Row behind. 16 D None No Power Seat 16 D has limited recline due to the Exit Row behind. 16 E None No Power Seat 16 E has limited recline due to the Exit Row behind. 16 F None No Power Seat 16 F is a standard Economy Class seat that Delta designates as Preferred Seating which is reserved for Delta Medallion members. This seat may be selected by Medallion members at time of booking or afterwards. This seat becomes available to all passengers at time of check-in. This seat has limited recline due to the Exit Row behind. The seat cushion at this seat is thinner than that of the standard Economy Class seat. 17 A None No Power Seat 17 A does not recline due to the Exit Row behind. This seat has extra legroom due to the Exit Row in front, however the protrusion of the exit door may be bothersome. The seat cushion is thinner than the standard Economy Class seat. The tray table is in the armrest, making the armrest immovable and slightly reducing the seat width. 17 B None No Power Seat 17 B does not recline due to the Exit Row behind, however this seat has extra legroom due to the Exit Row in front. The seat cushion is thinner than the standard Economy Class seat. The tray table is in the armrest, making the armrest immovable and slightly reducing seat width. However, Delta designates this seat as a Preferred Seat, which is reserved for Delta Medallion members. This seat may be selected by Medallion members at time of booking or afterwards. This seat becomes available to all passengers at time of check-in. 17 C None No Power Seat 17 C does not recline due to the Exit Row behind, however this seat has extra legroom due to the Exit Row in front. The seat cushion is thinner than the standard Economy Class seat. The tray table is in the armrest, making the armrest immovable and slightly reducing seat width. However, Delta designates this seat as a Preferred Seat, which is reserved for Delta Medallion members. This seat may be selected by Medallion members at time of booking or afterwards. This seat becomes available to all passengers at time of check-in. 17 D None No Power Seat 17 D does not recline due to the Exit Row behind, however this seat has extra legroom due to the Exit Row in front. The seat cushion is thinner than the standard Economy Class seat. The tray table is in the armrest, making the armrest immovable and slightly reducing seat width. However, Delta designates this seat as a Preferred Seat, which is reserved for Delta Medallion members. This seat may be selected by Medallion members at time of booking or afterwards. This seat becomes available to all passengers at time of check-in. 17 E None No Power Seat 17 E does not recline due to the Exit Row behind, however this seat has extra legroom due to the Exit Row in front. The seat cushion is thinner than the standard Economy Class seat. The tray table is in the armrest, making the armrest immovable and slightly reducing seat width. However, Delta designates this seat as a Preferred Seat, which is reserved for Delta Medallion members. This seat may be selected by Medallion members at time of booking or afterwards. This seat becomes available to all passengers at time of check-in. 17 F None No Power Seat 17 F does not recline due to the Exit Row behind. This seat has extra legroom due to the Exit Row in front, however the protrusion of the exit door may be bothersome. The seat cushion is thinner than the standard Economy Class seat. The tray table is in the armrest, making the armrest immovable and slightly reducing the seat width. 18 A None No Power Seat 18 A has extra legroom due to the Exit Row in front. The seat cushion for this seat is thinner than the standard Economy Class seat. The armrest is missing on the window side which makes this seat less comfortable. Passengers have also reported that it can be difficult to reach the pull down tray table from the seat in front, thus you often have to lean far forward to reach it. This is a Preferred Seat which is reserved for Delta Medallion members and may be selected by Medallion members at time of booking or afterwards. This seat becomes available to all passengers at time of check-in. 18 B None No Power Seat 18 B has extra legroom due to the Exit Row in font. The tray table is in the armrest, making the armrest immovable and slightly reducing the seat width. Delta designates this seat as a Preferred Seat, which is reserved for Delta Medallion members. This seat may be selected by Medallion members at time of booking or afterwards. This seat becomes available to all passengers at time of check-in. 18 C None No Power Seat 18 C has extra legroom due to the Exit Row in font. The tray table is in the armrest, making the armrest immovable and slightly reducing the seat width. Delta designates this seat as a Preferred Seat, which is reserved for Delta Medallion members. This seat may be selected by Medallion members at time of booking or afterwards. This seat becomes available to all passengers at time of check-in. 18 D None No Power Seat 18 D has extra legroom due to the Exit Row in font. The tray table is in the armrest, making the armrest immovable and slightly reducing the seat width. Delta designates this seat as a Preferred Seat, which is reserved for Delta Medallion members. This seat may be selected by Medallion members at time of booking or afterwards. This seat becomes available to all passengers at time of check-in. 18 E None No Power Seat 18 E has extra legroom due to the Exit Row in font. The tray table is in the armrest, making the armrest immovable and slightly reducing the seat width. Delta designates this seat as a Preferred Seat, which is reserved for Delta Medallion members. This seat may be selected by Medallion members at time of booking or afterwards. This seat becomes available to all passengers at time of check-in. 18 F None No Power Seat 18 F has extra legroom due to the Exit Row in front. The seat cushion for this seat is thinner than the standard Economy Class seat. The armrest is missing on the window side which makes this seat less comfortable. Passengers have also reported that it can be difficult to reach the pull down tray table from the seat in front, thus you often have to lean far forward to reach it. 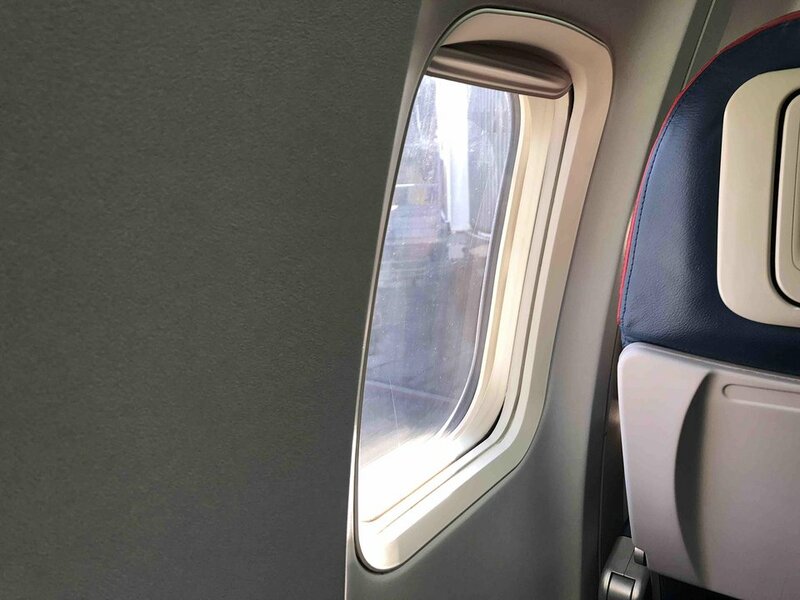 This is a Preferred Seat which is reserved for Delta Medallion members and may be selected by Medallion members at time of booking or afterwards. This seat becomes available to all passengers at time of check-in. 19 A None No Power Seat 19 A is an Economy Class seat. It is a Preferred Seat which is reserved for Delta Medallion members. This seat may be selected by Medallion members at time of booking or afterwards. This seat becomes available to all passengers at time of check-in. 19 C None No Power Seat 19 C is an Economy Class seat. It is a Preferred Seat which is reserved for Delta Medallion members. This seat may be selected by Medallion members at time of booking or afterwards. This seat becomes available to all passengers at time of check-in. 19 D None No Power Seat 19 D is an Economy Class seat. It is a Preferred Seat which is reserved for Delta Medallion members. This seat may be selected by Medallion members at time of booking or afterwards. This seat becomes available to all passengers at time of check-in. 19 F None No Power Seat 19 F is an Economy Class seat. It is a Preferred Seat which is reserved for Delta Medallion members. This seat may be selected by Medallion members at time of booking or afterwards. This seat becomes available to all passengers at time of check-in. 32 C None No Power Seat 32 C is a standard Economy Class seat, however close proximity to the lavatories may be bothersome. 32 D None No Power Seat 32 D is a standard Economy Class seat, however close proximity to the lavatories may be bothersome. 33 A None No Power Seat 33 A is in the last row of the plane and has limited recline. The close proximity to the lavatories and galley may be bothersome. 33 B None No Power Seat 33 B is in the last row of the plane and has limited recline. The close proximity to the lavatories and galley may be bothersome. 33 C None No Power Seat 33 C is in the last row of the plane and has limited recline. The close proximity to the lavatories and galley may be bothersome. 33 D None No Power Seat 33 D is in the last row of the plane and has limited recline. The close proximity to the lavatories and galley may be bothersome. 33 E None No Power Seat 33 E is in the last row of the plane and has limited recline. The close proximity to the lavatories and galley may be bothersome. 33 F None No Power Seat 33 F is in the last row of the plane and has limited recline. The close proximity to the lavatories and galley may be bothersome. There are 12 channels of audio entertainment on this plane. You can bring your own single-prong headphones or purchase them onboard for $2. There are regular 110v AC power ports located at every First class and Delta Comfort+ seat on this plane. 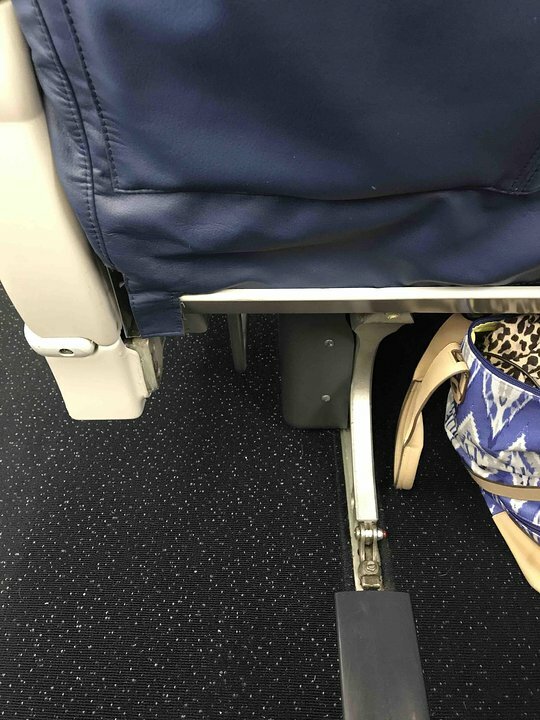 There are no power ports available in Economy. All seats feature USB power ports. Delta's 737-800 are identified as 73Y or 73H and may be displayed as such on booking itineraries or schedules. Aircraft identified as 73Y only feature power ports in First Class in addition to overhead television screens in both cabins. Delta is in the process of converting all 73Y aircraft to 73H configuration however both types feature inflight Wi-Fi. Pretty good seat with lots of head and leg room. It's a firm plastic seat as others have noted, but good enough for ~2 hour flights. Pro tip: bring a pad cut out from a thin rubber-foam yoga mat because it folds small enough to fit into the satchel and adds much comfort. As a template you can use a bucket seat in a car, which also makes the pad useful for long drives in that car. On the right you get 2 windows: 1 is right beside the seat back, which means the elbow and shoulder room is quite ergonomic (seat 10F is opposite, no elbow room). There's a view of the engine + the front window for general view. If the sun is low you can lower the shades halfway to view the LCD and still have light on the fold-out table. The new recliner slides the seat and lower seatback forward which might take a couple of tries since the sliders aren't lubricated very well. Still good leg room while reclined. There is no longer a fixed bulkhead in row 10. Only a cieling mounted divider screen is installed. This row should be labeled green now as there is extensive foot and legroom that was previously blocked with the fixed wall. I took the flight from ATL to LAX. Seat 11D - comfort + The seat had very minimal storage under the seat in front. The electronics and placement of the seat leg made it impossible to put a very small roller under it! Avoid this seat if possible! Fairly standard first class seat for Delta narrow body aircraft. Comfort level better than normal . IFE was very good. I sat in Seat 3C returning from Orlando to Boston. I paid good money for this First Class seat, only to have the guy in front of my put his seat back all the way. After that, I had NO leg room and couldn't even put my tray table out because the seat literally was almost sitting on my knees. 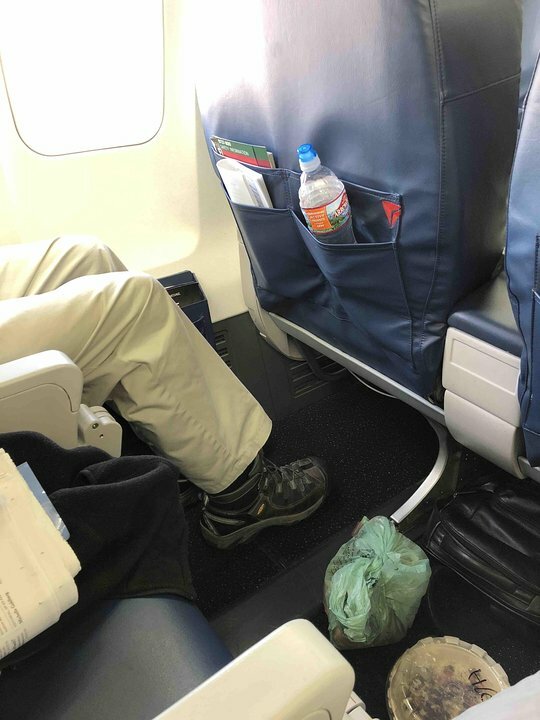 The flight attendant saw it and did nothing, she just rolled her eyes when she tried to give me a drink, like it was my problem I had no room to put my drink down. My daughter was in Seat 3D and had the same problem. Very unhappy with these seats. The other reviews for this seat are accurate: avoid it if you can. The seat cushion is noticeably thinner -- it felt like I was sitting on a piece of plywood. The lack of a right armrest and a misaligned window added to the misery. The extra legroom is nice of course, but in my opinion doesn't make up for the other drawbacks. Seat was nice, althoug it was messy when serving the meal. Engine noise was descent. Things are fine down the back except for the occasional bathroom queue. Note that this aircraft now has seat power all the way through Economy. There is a universal socket at the base of each armrest, facing the seat behind (2 sockets for each 3 seats). A good seat, but one of the speakers for announcements is over row 12 and this makes for a LOUD flight at times. Seat was comfortable, however, if the seat in front of you is fully reclined, there is very little space to get into the aisle. The last row of seats on this plane should be removed. There is absolutely no room to the seats in front and no head rest. All the people in the plane have to pass this row and flush the toilets. There is no room in the aisle for people to wait for the bathrooms. 2 bathrooms for the entire plane minus first class is obscene, especially on a five hour flight. Worst plane I have ever flow on. Also all the six overhead bins were taken for the last three row of seats by the crew and for emergency equipment which meant any carry on items had to be at your feet which made the leg room even more unbearable. Plane designed for profit not comfort. I did not feel this seat should be a full-on yellow. There was a ton of room between this row and the row ahead of it, and lot of room underneath the seat in front. As most exit row seats in these new planes, there was absolutely no padding in the seat. I was on a 2.5 hour flight and I felt it by the end. I wouldn't sit here on a longer flight if that is something that bothers you. The "armrest" to the right, was fixed, so that the seat would otherwise be narrow, but it was not fixed to the left. In fact, that armrest was affixed to the exit door, so there was actually more room for hips/legs than there otherwise would have been. It had more space in an exit row window seat that I would have expected. The door was cold, though, so if that bothers you, factor that in. I would sit there again if I could not get an aisle seat. ALL Last 1st Class Rows like row 4 here get last choice on meals better to be in row 2 or row 3 to get better meal choices. This is the same with ALL flights all 1st class. Worst first class product flying in the intercontinental U.S. Seat recline is no better than coach. Other first class services are equally poor. Great exit row seat lots and lots of room. This js a new internet equipped plane so video streaming is available. 3B has split storage at your feet. The centermost one is so short (7?) that a backpack (not stuffed) wouldnt fit. The one by the aisle is maybe 10 wide and at most 10 high. The seat was adequate for the short flight from SLC-SEA. There are large seat back tv screens and 2 power ports. I put my backpack in top first and most of it stuck out into the aisle. One of the most uncomfortable domestic business class seats I've experienced in recent memory. The seat barely reclines, making for an uncomfortable 5 hour red eye from SAN-JFK. While the IFE has been upgraded, sleeping in these business class seats is near impossible. Avoid this plane if possible! Thus seat on this 737 has very limited underseat space because of entertainment equipment. I sat in 10F with family members in D and E....E was used by our ten year old grandson so no issue as some have said that the seat is small....i did not notice. The best thing is that there is so much leg room...much more than the rows behind row 10. I am 5 feet 6 and my foot barely touched the seat in front when i stretched it out.....I would choose this seat again for this reason. I read reviews before the flight and just want to emphasize that they are not kidding about it being COLD....there are vents and my feet were icy throughout the flight.....I had sandals on.....wear socks and shoes....cover the vent with a magazine ( eventually had to do this)....my grandson had seat A going and that is why he wanted the middle seat when we went home!....because of the cold air. other issues was that my tv screen was jammed nd ould not pull out for viewing....my grandson's did....but the volume would not work.....still the most important thing to us was that there was lots of leg room! Would take it again....bring down jacket to wrap around feet!! This 737-800 is different from the floorplan listed here. The safety information card lists it as an -800(A) and the first row of First has AMPLE leg room. Ahead of these seats are two closets, not a partition on the left and a galley on the right. I expect these seats to be quiet as they are quite far back from the forward galley. Also, I am not sure why the details of these seats list "no footrest" when none of Delta's domestic First seats have them. I would color this seat, as well as seats 1B, 1C, and 1D GREEN. This seems to be an older plane. The seat was comfortable enough, and window aligned well. The in-seat screen in front was hard to manage and I couldn't get the movie to play since touch-screen was unresponsive, so that was frustrating. Ear bud connection was in seat arm, not under the screen, and usb connection was in at the bottom of the seat in front. It was kind of cold next to the window, so bring a sweater or light blanket. I flew in the latter part of April. A one cheek ride for 5.5 hours on LAS to JFK. I am 5'10" and have a 32 inch waist. My entire body does not fit in this extra narrow seat and I am partially riding on a seat and out of it. Due to the lack of armrest you cannot even prop yourself up. Terrible ride for such a long flight. NOT worth the extra leg room. Ok first class. It has a small TV, which is obviously better than nothing but its not one of the big, new ones. The bulkhead was not solid and only blocked the top half. There we had underseat storage and plenty of leg room. I am not sure if all 737-800 have their bulkheads updated. I am 6'4" 280. The seat has lots of legroom. The seat appeared to be fairly new was very comfortable. I liked the in flight entertainment system. Great bulkhead! No wall in front so it's very spacious. A blanket was even provided . Delta "comfort" is very stingy with the room fore-aft. A narrow seat (737 6-across, much tighter than an Airbus 320), and definitely not enough room in front to work on a laptop -- even a MacBook Air leaves your elbows pushed up around your belly. But looking at the passengers behind, I could see that most of them didn't even have room for their knees. Very pleasant crew, and a few free snacks (like a banana) which I wasn't expecting. This was a comfortable seat with individual entertainment center. My only complaint was that there was limited under seat storage available due to electronics/hardware under there. There was no bulkhead in front of me so leg room length-wise was ample. The storage pocket near floor level on the fuselage wall, on the other hand, dictated how I positioned my legs throughout the flight and was not as comfortable as 10D, which I had on the previous flight. The seats are definitely narrower and the tray table less usable. In addition, the in-seat entertainment monitors must be stowed for takeoff and landing which leaves some time without the entertainment options that every other seat has. Recommend row 11. It doesn't have as much legroom, but does not have the width issue, nor the in-seat entertainment issue, and the legroom is ample for at least 6'2" people. Small plane for cross country trek. Not a ton of extra room in seat 11D to be considered Delta Comfort and bathroom all the way in the very back, no mid cabin bathrooms. Will avoid this plane in the future if possible for flying on east coast to west coast trips. Delta is way better than many US carriers these days though. At least they have entertainment monitors at each seat for the longer flights to help pass the time. But lets face domestic travel has just become horrible. I want to add my agreement that these are the most uncomfortable First Class seats I've had in a long time. ALMOST NO SEAT RECLINE MEANS IT IS IMPOSSIBLE TO SLEEP. Ship 3715 (N385DN) PHX-MSP on 10/9/16. Bulkhead was removed and only a curtain divider separated First from Comfort+. This gave ample legroom (I'm 6'1) and allowed for under-seat storage. Seat width is still a bit reduced due to the fact that the tray table is in the arm rest. Entertainment flips up from in front of arm rest. Overall not a bad seat at all. Most uncomfortable first class seat ever sat in. No recline. No leg room.no headrest. Had more room in jetblue extra spaceccoach seat. Seat 12F is very good. There are 2 windows and not weirdly placed. They are perfect and makes it great for anyone with the middle and aisle seat. 10/10 would sit here again. Flew the 737-800 from ATL to DTW painted with the SkyTeam livery. It had the seatback TVs and WiFi, but no power outlets --at least in standard economy. Entertainment system was slow and clunky (plus some content was months old), but can't complain too much. Decent plane overall. plenty of seat room - but this plane does not have media in each seat and only drop down tv's with 1 show. Leaving orlando - should have better entertainment for families. Plus the flight attendant was stingy with drinks and snacks and we were in comfort!! First time flying Delta and the last. I was gravely disappointed. We were kicked off the plane!! They said it would be an hour but it took 5 hours. Flight attendants were very grumpy. Seat padding thin. I asked to be changed to another airline but they said no. Food was ok. My freind's TV did not work at all no matter how many times they rebooted it. Was unable to see the sight in daylight because of this airline. Thanks for ruining me for trying new airlines Delta. IT IS ALL YOUR FAULT!!!!!!!!!!!!!!! I can't express how much I hated this flight. The problems started right as I got on the plane. Te first problem was that a baby started running up and down the aisle and was KICKED OFF OF THE PLANE by a crabby old flight attendant. After about 30 minutes of just sitting there, we finally pushed out of the gate. We went about 200 feet and then TURNED BACK TO THE GATE!! The pilot said that "some switches aren't functioning correctly, and we hope to get you out of here in about an hour, so sit tight." They didn't turn on the entertainment systems, and ALL 3 bathrooms were CLOGGED!! They ended up taking off people who were flying to AMS, but not to CDG, like me! After THREE hours, they took us off the plne for another 4 hours, and then we FINALLY got moving. The seat was hardly economy plus, let alone economy! NO LEGROOM OR RECLINE!!! We got into BOS (from LAX) at around midnight, and I missed my flight to CDG! I had to PAY THE TICKED AGAIN FOR ANOTHER FLIGHT!!! NEVER DELTA AGAIN! I WILL STOP 20,000 TIMES OVER TAKING A NONSTOP ON DELTA!! This is a horrible plane. I have flown in much better econemy seat. In flight entertainment was ok but not the best. When they asked if I wanted a cookie, IT WAS NOT EVEN A COOKIE! I cannot believe how Delta mislabeled this piece of food! Plane was pretty old and worn out and should be replaced with a newer plane. Worst flight ever! My first time flying Delta. Don't understand some of these comments about these seats. I was quite comfortable. I'm 6'2" tall. Perhaps others were 300 lbs plus! I'm not! Seat in front reclined I was still able to move and go to the bathroom. No problem. AVOD worked great. Food(breakfast) was delicious. FA's were so sweet. Flying again to Las Vegas in this same class! If you chose 30F because you like the window: beware. While there is a window, it is nearly aligned with the seat back making any comfortable viewing impossible. Seat cushion was very thin making the flight uncomfortable and it was a night flight. Wish I took American or United. No more Delta for me. Flew Phoenix to New York City, worst flight I have taken! Delay for 5 hours strait! Seat was not very comfotable. The flight attendants were okay but I will not fly Delta! I will fly American or JetBlue next time!!!! Plenty of leg room in this Delta Comfort Plus seat. Screen in seat back ahead of you with USB power but no electrical power. The plane I was on looked to have more then just 3 rows of Comfort Plus, closer to 6. No bulkhead between First and economy and row 10 seats had video screens that came out of the lower left part of the seat. I got the Delta Comfort seat to have a better ride..Nope! Legroom was ok, other than that, the seat was too cramped and the cushioning was horrible. If I didn't have to take Delta to a particular city I wouldn't fly them. The HAVE to pay attention to comment after comment and do something about this already. COmpletely agree with the previous comment. Recently flew business from New YOrk to Las Vegas. The business class seats are horrible. Very narrow and absolutely no leg room. I am 6 '2" and had to sit sideways once the person if front of my dropped their seat back. The flight attendant actually told me there was more leg room in economy plus. No more Delta to NY for me. 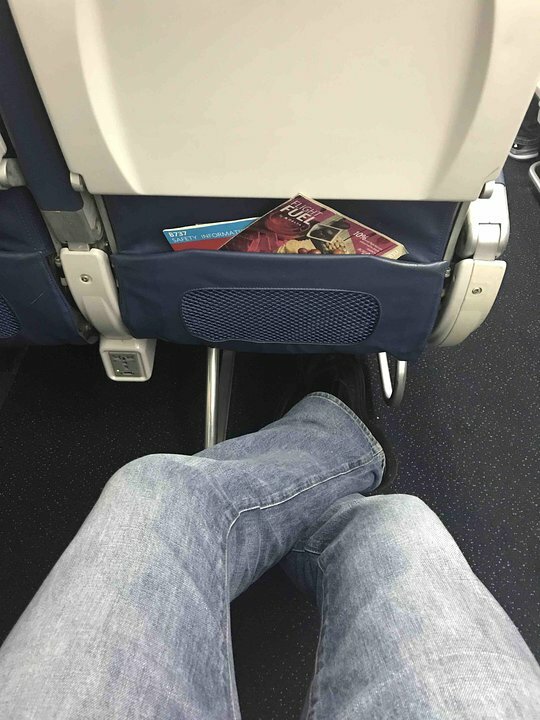 I recently flew from Atlanta to Tampa in first class. Delta has added a row to first class and changed their seats. It was the worst first class seat I ever experienced. The seat was nothing better than an economy seat. No legroom, narrow and I had the seat in front of me right in my face. Shame on Delta for offering such a so called First Class. The overhead bins for row 1 (both sides) are smaller than those in the rear and won't accept standard roller bags. Our 737-800 had Delta Comfort+ seats up to row 15. My family had the entire row. My daughter was in a car seat which fit nicely into the window seat. The arm rests moved up, but also had the earphone jack to listen to the IFES. System was a bit slow and dated, but still provided DirectTV live TV (football games!) as well as a number of movies, tv shows, kids programming, gaming and information. In addition to the limited leg room, there is a gap in the side panels at feet level from which ice cold air escapes. The same gap exists on the other side as well (next to seat 10F). The bulkhead wall has also been curved toward coach at the top making it impossible to get off the Window seat without having pax in 10B and 10C to move. From that seat you will also not be able to see the movie. With the angle, the screen appears all black. Probably one of the worst seat in that airplane. For so many reasons, I recommend avoiding this model. There is no window for seat 13 A, B & C. There are no individual screens for the watching of movies. There are screens, but you are at the mercy of whoever choses the movie. The plane is very noisy. The announcements on the PA system are unintelligible. And the temperature was very cold for more than half of the flight. In direct contrast to the outbound flight on 737-900 ER which was wonderful. Plenty of room to move around in this Delta Comfort seat - well worth the upgrade, even though this is a center seat. This was the worst seat ever. I knew about the non-recline and figured would be cold next to the door but didn't realize it would be such a narrow seat. However, the worst was that it was hard as a board and after a 5 hour flight, I could hardly stand. No restricted legroom. No bulkhead in front of this row. Baggage can be stored normally under first class seats in front. Only curtain divider between this row and first class seats. Very good seats in this row. This seat has no cushion at all and is like sitting on a board. It is lset lower than the other seats to. Seat cushion for 18A was thinner, but also narrower. With lack of armrest, I felt I was hanging off left edge of the seat for 3 hours. One of the worst exit seats I've tried. A320 and MD90 exit windows are far better than this one. Other hand, tray table was not a prob at all despite Seatguru comment. I have flown on this aircraft numerous times. The cabin atmosphere is quite nice, and the recliner style seats are quite nice. Each also include personal TV screens in every seat on this particular 73H config. Depending on your size and preferences, you either will love or hate this plane. Everyone I know who has flown on it all seemed to enjoy this aircraft very much, along with myself. Looking forward to flying on one again soon! This is a red seat It is narrower than the other seats, it has less legroom than a seat in normal economy and no baggage storage under the seat in front of you. In my experience, it is the single worst seat on the plane. And it certainly is not an Economy "Comfort" seat -- well except as defined by the Marquis de Sade. I would avoid as I value leg room over having a passenger recline into my space...but all contingent on what is more bothersome to you. The seat is narrower like the ones in front of it. For a big guy like me iit was very uncomfortable. There is an armrest against the door and it is not comfortable. The seat is about 3/4" more narrow than the aisle seat and the seat cushion is thinner and less comfortable, extra firm. Still has extra legroom though and it reclines. Seat was comfortable. Food decent airplane food. i needed to travel with my cat, which had to be under the seat as a carry-on, something I've done many times. This time the air conitioning was so cold that i put the blanket, my purse, and my coat down to protect her, and my feet, from the cold air. Return trip will be an aisle seat, and hopefully warmer. Flying on this plane is like riding in a time machine - get a seat in the first class cabin and you can experience what coach class air travel was like twenty years ago. The measly seat pitch in seat 2D ensured that my knees were no more than a couple of inches from the seat in front of me. To get out to the aisle I had to do a 180 and crawl over my seat mate face-to-face. The meal and beverage service were just as exquisite. Delta should just rename the front cabin "Economy+" and just get over with it. One of the worst planes I have ever flown in. I made the huge mistake of sitting in seat 13-A which is one of Deltas "premium" seats. It was anything but premium. There is no window even thought hey classify it as a window seat. The economy comfort seats are in front of this ros so they recline much further than a normal seat. The back of the seat in front of me was literally 6 inches from my nose and I only weigh 145 lbs. The seat was cramped, uncomfortable, hot and claustrophobic. Avoid row 13 at all cost. Actually I would avoid this entire plane at all cost. 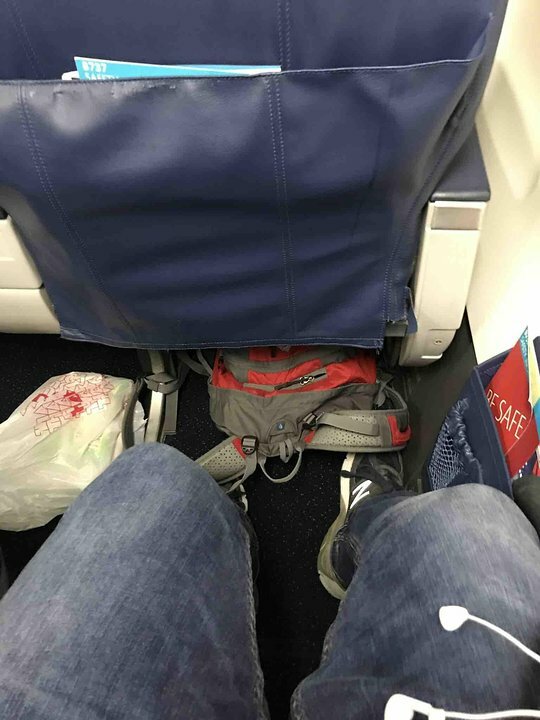 Lots of leg room and when you're 6'5" that means a lot, BUT the trade-off may not be worth it. The comfort of the seat is definitely inferior to the rest of the exit row; the padding is noticeably thinner. After a transcontinental flight (JFK/SEA) my buttocks hurt. Also, the emergency exit window made the seat cold during the flight. I needed two blankets to keep warm. This is a very good economy comfort seat. It has two windows. I thought this was a great find as it was an exit row seat that was not a preferred seat, however shortly after sitting down I found out why. It felt like I was sitting on a piece of plywood without any padding the whole way from Miami to Minneapolis. Probably the most uncomfortable I have ever been on any seat on a plane before. Sadly it was a completely full flight, and I couldn't move. Pick a different Seat! Plenty of room for legs to stretch out. Good recline. Cushy seat cushion with blanket, pillow and bottled water waiting. Super friendly and professional FA's. I didn't really use the in flight entertainment other than to watch the flight tracker. Those with noise cancelling headphones seemed to be enjoying sports, TV shows and movies though. Delta domestic first is really quite good. The flight crew mixes some really good cocktails. Do sit in first if you are able. I enjoyed the extra legroom in 17A on the 5-hour flight from JFK to LAS. The main problem with 17A is the substandard seat cushion. At first, I did not think it would be a problem, but as the flight progressed my rear felt the lack of cushioning more and more. Another downfall of 17A is it does get very cold, but Delta was kind enough to provide a blanket. I would highly recommend 17A for a 2-hour flight, but no longer. The seat 2b was comfortable, each seat had its own entertainment scree which was kind of slow in responding. The service for this 47 min flight from BNA to ATL was much better than 2 hour flight with AA in first Class. This 737 had the alliance Sky team paint work. Crew were nice and even with full plane we departed on time. I wanted to put in a positive comment for Seat 1B. Although there is no foot rest, you can stretch out your legs with your feet against the bulkhead, which I like to do. I like this seat! This is perhaps the most uncomfortable airplane seat in which I have ever sat. Imagine a block of concrete with seat covering. It did have good legroom, but it does not recline, and be prepared to jostle with you row mates as you try to reach the armrests which feel a tad low (which could be due to the fact that the seats had no "give"). All in all, I would rather have been strapped to the wing than having sat in this seat. Very cramped seats. When the person in front of you reclines a laptop can not be used. Took this plane round trip from MIA-LAX non-stop. Booked the same seat each way. Be aware that the seat cushion is thin and can become uncomfortable rather quickly. Didn't think the exit row would be that bad, and thouth the extra leg room was worth it. Wrong! 17F Felt like I was sitting on a piece of plywood the whole way from Florida to Minnesota. Most uncomfortable airplane seat ever. Felt like I was sitting on a elementary school plastic chair. The armrest is built into the wall and very small. Bulkhead is so close it offers NO footroom; it's very uncomfortable, and rates a solid yellow. Delta flies 1 versions of Boeing 737-800.